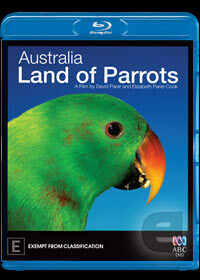 What better format for a documentary on Australian parrots than Blu-Ray which takes the viewer on a behind the scenes journey of these colourful creatures. With that said, the Blu-Ray quality is truly outstanding as the vibrant colours of these wondrous birds truly comes forth on this blu-ray presentation which almost makes you believe you are in the wild. The documentary is masterfully narrated by Colin Friels as film makers David Parer and Elizabeth Parer-Cook film these birds in their natural Australian habitat in high definition. Focusing on the family of these birds, they really give the viewer a unique insight into their lives and how the changing face of the Australian environment has caused their birds to alter their everyday lives. Even if you're not a bird lover, you will appreciate the information gained in this DVD and match that with the exceptional quality of Blu-Ray and this is one documentary that is a must have. Gorgeous!